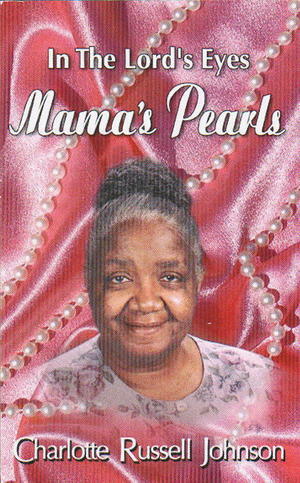 Mama s Pearls is the sixth book in author Charlotte Johnson s series of motivational text. This book is a very poignant chronicle of the faith, wit, and the down home charm of Ms. Johnson s mother, Evelyn Russell. Loyal fans of Ms. Johnson have already developed a feeling of closeness to her mother, affectionately called Mother Russell. Throughout Ms. Johnson s books, her mother serves as a spiritual mentor teaching her about love and redemption through her selfless love. Mother Russell loves, when it seems that her daughter is beyond change and is unwilling to embrace her mother s instructions. Mother Russell is a paradox. She is both a spiritually mature student of the Bible, while maintaining her down home folksy charm, sharp tongue, and nostalgic stories of her youth that serve to entertain the reader. These stories offer inspiration, encouragement, hope, and motivation. More importantly, these oral traditions serve as method of handing down the wisdom of times past. A mother s love can be essential to a child s emotional well-being and character development. Charlotte Johnson shares her mother with the world to offer hope and encouragement in troubled times. This book is excellent for those in need of hope, seeking a miracle, searching for a way to maintain their faith, or looking for an uplifting and humorous book. Mother Russell grew up in a family where oral storytelling was a method of passing family wisdom and traditions to the younger generations. She passed these stories onto her children. These stories are a combination of Mother Russell s life experiences and oral traditions passed from her father. My heart was touched when Ms. Johnson wrote earlier in her series, Mama why do you still care? Mama s Pearl answers why a mother still cares when all hope is gone and the world has given up on her child. As Ms. Johnson explores her family s past in order to bring light and perspective to the present, Mama s Pearls is reminiscent of Alex Haley s Roots.